As usual, I started a project without a real understanding or plan. I had seen some Flip and Stitch wreaths online, and I also found some tutorials. Most of the tutorials used three fabrics, but I found a DIY post on Pinterest. 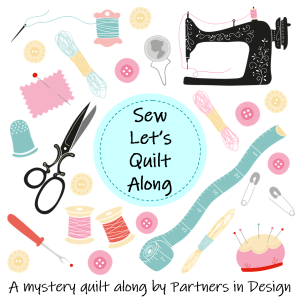 The post referred to a pattern; and I do have a pattern that calls for using three fabrics. However, the post offered photos and directions for making the blocks using only two fabrics. I had just enough Christmas fabric for a two fabric wreath. The post did not explain how to stitch the blocks together, but referred to the pattern for directions. I figured I could just eyeball the wreath and figure out how to stitch them together. Then, I sort of reread the pattern, and thought I knew what I was doing. However, this time, I did get a circular wreath of some sort. It was just without a hole in the middle, and I could only fit 9 blocks instead of the 12 I made. I was just about to pitch the whole thing, when I decided to try to salvage it by covering the center with a yo-yo. I also made an applique circle for the backing. Then, I added miniature yo-yo’s to attach the flipped sides. My failure to plan led to failure. But then, my failure led to a seat- of- the- pants fix. It is not what I expected, but it will do. I added a strip on the back, so it can hang. It can also be placed as a center piece. I made this for my sister, who likes to decorate for Christmas. She has an early December birthday, so I will through this in the gift bag. My friends threaten me with fashion citations over my choice of clothing, especially around the seasons. They remind me that I am retired, and I do not have to entertain children with shirts that have sparkly Christmas symbols on the front. So, today, when we met for a Meemaw craft day, I had a more subtle touch to my holiday wear. I chose not to wear my peppermint candy striped high top Converse tennis and just settled for wearing my cardinal pendant and earrings. I left my blinking light bulb earrings and necklace for the next time we meet. However…I did supply each one of us with reindeer antlers. When my friend’s husband returned home and saw us working with our antlers, he stood at the door and just shook his head. One problem with the antlers…every time we bent down to work together on something, our antlers would lock. We met to make the 10 minute table runners. We started at nine, had an hour lunch, and finished at one. So much for the 10 minute runner. Last night, I ran across patterns for flip and stitch wreaths. I think this will be my next, hopefully quick, project. My sister has a birthday in early December, and I think this would make a cute present.